Space for many individuals will be a constraint when choosing a toilet. With a wall mounted toilet, it is possible to save on an average around 12 inches of space compared to a floor mounted model. Also known as a wall hung toilet these models incorporate a concealed tank, thereby helping in leaving a very small footprint in toilet floor area. And with spectacular designs available you will find all the more reason to opt for this ultimate space saver and uber utilitarian model of toilets. 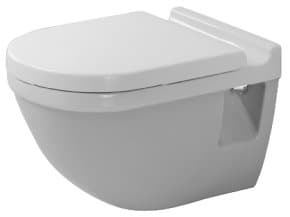 This wall hung toilet review will showcase some of the standout features and specifications that will help you pick the best one. This ceramic model comes in a dual flush system which conserves water. Users get to choose between a regular flush that or a water conserving flush. True to its reputation as a brand that believes in delivering the best designs, this is minimalistic and elegant. Cleaning it is a breeze, because it does not have a floor contact. It comes with a concealed tank which goes into the wall to save space, and it comes in an elongated design, which means that users get maximum comfort despite the saving of space by this model. You actually get to save 12 inches of precious bathroom space with model, in addition to better cleaning operations, comfort and a dual flush. Definitely worth every buck spent on it. Saves 12inches of space in a bathroom, which for many is like saving prime space. Effective dual flush conserves water, while efficiently flushing waste without any odor. The plastic covers seem to come off easily and the two way tape that is supposed to hold it in place is ineffective. 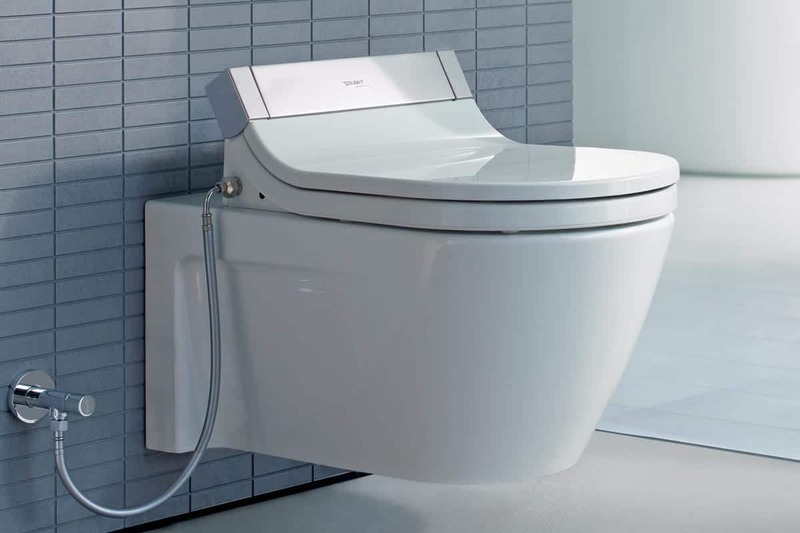 The pole position for this model is a combination of sleek looks, water conservation features, space conservation, efficient flushing and of course the concealed design of the tank that makes this a must have for those who have prefer a wall mount toilet with tank. From the stable of American standard wall mount toilets this is an high end model. Despite being a wall hung model, it features a back tank which is a lot different from expectations. However, this model saves space from the floor mounted models, because of the compact size. Additionally the tank design means that complex concealing modifications in the wall are not required. 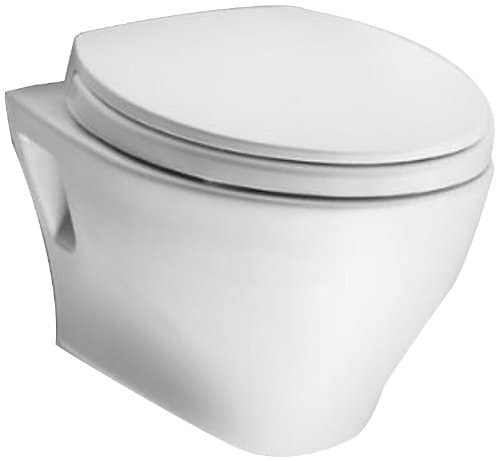 It is one of those stylish vitreous china toilets that are non porous, making it easy to clean, with a glazed design. The flushing system is pressure assisted, which means that flushing is one of the most effective and efficient. It comes in a design that is simplistic with the right kind of detailing in the form of levers to give better esthetics to the model. The flush operates a little bit noisily, which needs to be tackled to offer a better experience to users. Despite having the back tank in tow, this has made it to the second on this list, due to the functionality and the ease of installation, in addition to its style quotient. This is one adorable product that is small in size and powerful on performance. It comes with a dual max flush, which means that you get to save water when flushing liquid flush. The height is universal which means that you need not sit at an unnatural angle and feel uncomfortable. This can be smoothly paired with an in-wall tank, to make it more concealed and save additional space. The bowl is of an elongated design, which adds to the comfort. The combination of universal height, and elongated bowl shape make this a good toilet to have in washrooms that are small in size. This is one of those simple and elegant models that conserve space and make the washroom look stylish. A good toilet to have in washrooms that are short on space. A trend setter, this model seems to pose a challenge to conventional design features of toilet shapes. The square shape is just one of the many differences that this model offers. It is fully ADA compliant, which means that you can install it at a height of your preference, making it easy for anyone to use – the aged and the disabled. The shape coordinated design gives it a seamless look that makes it very appealing. This is a stunner that comes with the standard water saving features such as ultra low flush and dual flush. Variable height installation makes it one of the more disabled friendly models in this list. The shape is great as a design concept, but users need to get used to squatting in a position different from the regular round or elongated bowl shapes. This is truly, the stunning model in the list, with interesting features that combine an esthetic design with superb functional features, worthy of your washroom. If you are on the lookout for a model that saves the most space, then this is the one for you. It is ideal in washrooms where space is a serious issue. It comes in a nice compact design, is simple in shape, and minimalistic in terms of features. As far as functional use is concerned, you will find that it meets your requirements without any fuss. The flush is pretty decent and effective, cleaning and maintenance is easy, and what’s more, it has a dual flush which means that you get to save water with liquid flushes, as with the other models on this list here. It is compact, elegant and fully functional. The water level in the bowl is shallow, which means that cleaning frequency will be closer to each other. This is the ultimate space saver model on the list. You get to save the maximum space, while enjoying all functions offered by other models on the list. A good toilet to have in the washroom and in the list. Must Read: Which Is The Best Upflush Toilet For Your Bathroom? 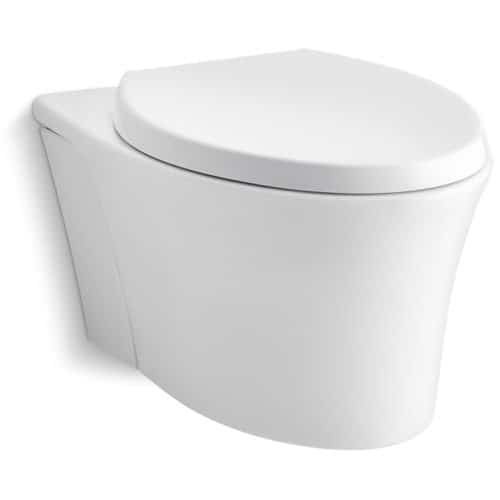 Our wall mounted toilet reviews are compile to assist readers identify the top rated wall hung toilet for washrooms. A look at the important features of the toilet will help users decide on the best model. Here are some of the features explained in detail to help you choose the ideal wall mounted toilet. You need to check the amount of water used for flushing. A dual flush system will help in reducing water consumption. It is a matter of fact that a regular flush is not necessary for flushing liquid waste, which means that the same amount of water is not required. If you care about conserving natural resources, you can check out the models that save on water consumption with each flush. While models that require lesser volumes of water for flushes are a good choice, it is important to choose one that has an effective flush. The reason is quite simple – an ineffective flush will result in the need for multiple flushing, which have the exact opposite result on water conservation efforts. If you opt for an elongated model, you will find it easier to use the toilet. A round model will be relatively uncomfortable. However, there are other factors that need to be considered. A round model is easier to clean, whereas a narrow model is tougher to clean. Universal seat height will offer greater comfort to the user. 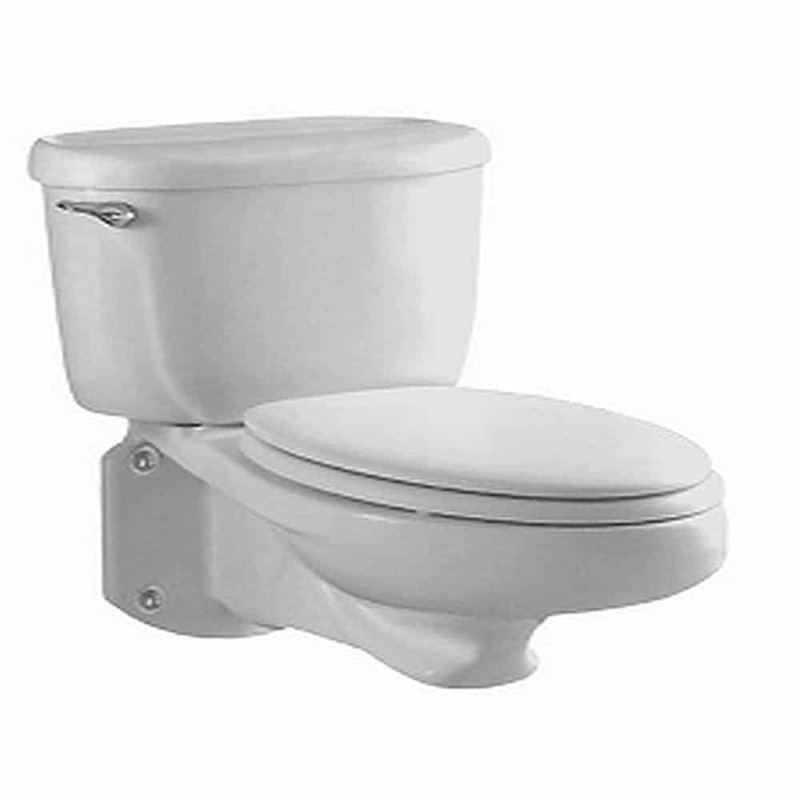 If aged people reside in the house, you need to opt for a toilet that comes in a perfect seat height. A toilet that does not come in an universal seat height will make it necessary for users to adjust their posture while using the toilet. A pressure assisted flush is certainly an added feature that is worth mentioning. This actually is one of the more effective flushes and if it is combined with low water consumption or dual flush system, you will find it to be very useful. There could be a downside though to this feature – it comes with a slightly higher noise level during flush, because the pressure assisted mechanism will be a bit loud. Cleaning the toilet is certainly a chore, and having to do it repeatedly may not be the best of options. Therefore, choose model that is easy to clean. This means that you need to look at models that do not have a very narrow bowl, you need to look at models that are of the highest quality of vitreous china and ceramics. Our wall mounted toilet reviews are compiled through an approach that is systematic. 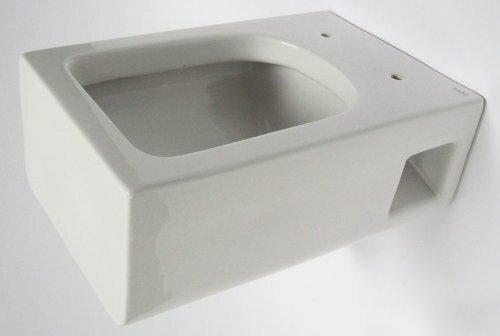 We look at the reputation of the brand, we look at various functional parameters of the toilet, the amount of space it saves, the efficiency of the flush, the cleaning friendly nature, the shape of the bowl and the height of the installation. We assign a scoring metric to all the aspects and the total gives us the overall rating which feature in the wall mounted toilet reviews. We look carefully into adverse aspects of the products, which actually brings the ratings down in the list, depending on the negative score, The top wall mounted toilet models that feature on this list are a result of careful compilation of various aspects to help us get a clear winner. Space saving toilet models are stylish not just in terms of the size, but also the sleek and compact design and the concealed tanks that come with most of the models. We take care to list out the features and arrive at the ratings of the most popular wall mounted toilets. However, specific requirements of users will differ, and it is best that the user considers specific requirements and compare the features to identify the most suitable toilet. The compilation is exhaustive and has presented all features, in a factually correct manner, and a simple interpretation is all that is required to understand them.